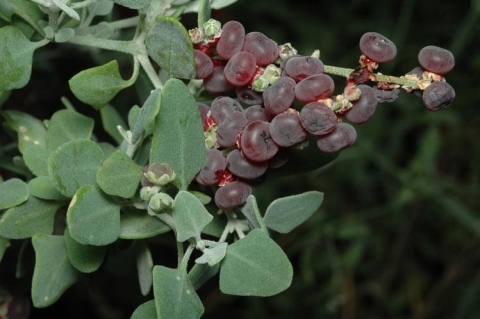 Spiny saltbush is an intricately branched, often spiny, evergreen shrub growing up to 3 metres tall. The edible leaves and fruit are sometimes harvested from the wild for local use. Mainly found in warm temperate areas, the plant does just find its way into the tropics. It is usually found in drier areas. Seed - sow spring in a greenhouse and only just cover the seed. Germination should take place within a week, prick out the seedlings into individual pots when they are large enough to handle and plant them out after the last expected frosts.